At our Feb 17, 2019 beach cleanup we took 450 lbs of trash off Albany Beach. Thank you, volunteers! ALDOG receives Certificate of Recognition from Albany City Council. We coordinated the first big microplastics cleanup in East Bay thanks to an Alameda Countywide Clean Water Program grant. Since 2013, we’ve taken 8,000 lbs+ of trash off Albany Beach. OUR NEXT ALBANY BEACH CLEANUPS & SAND GLOBES WORKSHOPS: Sunday, July 28, and Sunday, November 10, from 1 to 3 p.m.
NEW BEACH CLEANUP DATE IS FEB 17, 1 TO 3: Our Jan 20 beach cleanup and free sand globe workshop with environmental artists Zach Pine has been rained out. Please join us on Sunday, Feb 17, from 1 to 3! You can park for just $1 that day in the Golden Gate Fields parking lot (near the end of Buchanan Street). BEACH REOPENS DEC 28, 2018, FIRST BIG CLEANUP ON JAN 20 (1 TO 3): Albany Beach is scheduled to reopen on Friday, December 28. We have verbal assurances that “nothing will change” and that people will still be able to walk their dogs there. Yay! East Bay Regional Park District (EBRPD) will be doing construction behind the beach for several more months (on 20 new parking spots, a turnaround, a grassy area for kiteboarders to lay out their gear, and the completion of the Bay Trail). When the entire project is finished, we anticipate that new signage will go up that will include dogwalking rules. We will continue to work with the park district to ensure that park users are welcome to walk their dogs off-leash. MANY CHANGES TO THE BEACH: Many things are different about the beach area. You may like some and not others. ALDOG suggests that we break-in the new beach for a year. Then, if some things aren’t working, we should push for adjustments. * The paved paths and a mat leading down to the beach (for stroller and wheelchair accessibility). * Sand dunes fenced off as part of the mitigation area. * The new parking lot and turnaround. URGENT BEACH CLEANUP ON JAN 20: For various reasons, the new, broad beach above the tideline has rocks, rubble, and trash. EBRPD will clean that up before the beach reopens but it will need more work. 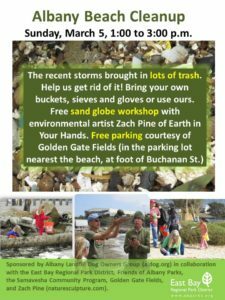 Environmental artist Zach Pine will hold another of his wonderful and free sand globe workshops for beach cleaners that day. The cleanup is also in collaboration with EBRPD, the Albany Beach kiteboarding community, Love the Bulb, the Samavesha Community Program, and El Cerrito Natural Grocery Company (which is generously providing refreshments). THANK YOU: Thank you to everyone who supported ALDOG, our advocacy, and our beach cleanups in 2018. We wish you wonderful times and happy dogs during the coming year. 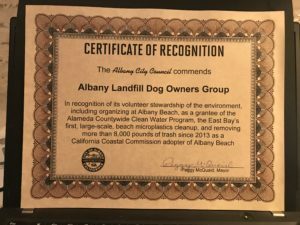 ALDOG RECEIVES CERTIFICATE OF RECOGNITION FROM ALBANY CITY COUNCIL: On 5 November 2018, ALDOG made a presen tation to the Albany City Council about its big beach microplastics cleanup in October 2017 (which removed 2,440 pounds of debris from the beach, including an estimated 500,000 nurdles, the pre-consumer plastic pellets used in manufacturing). Mayor Peggy McQuaid presented ALDOG with a Certificate of Recognition for our volunteer stewardship of the environment. ALBANY CITY COUNCIL CANDIDATES FOR AND AGAINST DOGS ON THE BEACH: ALDOG does not endorse candidates but we can educate the public about their positions. In the interest of education: Some state beaches do allow dogs; Albany Beach is co-owned by the state and East Bay Regional Park District (EBRPD); the beach is managed entirely by EBRPD, at East Bay taxpayer expense; under its 30-year operating agreement, the park district can choose to operate the beach using EBRPD policies, which are less restrictive than state policies. ALBANY BEACH SHOULD REOPEN BY END OF 2018: The beach-focused phase of the Albany Beach Restoration and Public Access Project should be complete by the end of the year. There will be more sand and better ADA access. Other parts of the project will take up to a year longer but eventually the Bay Trail will be completed behind the beach, there will be additional parking and real bathrooms, a launch area for non-motorized watercraft, and a seasonal wetland (where the parking lot used to always flood in the winter). ALBANY BEACH CLOSES MONDAY, AUGUST 6: A reminder that the beach closes on Monday for the Albany Beach Restoration and Public Access Project. It will be off-limits for about five months. There’s some talk about still doing Coastal Cleanup on September 15, if the beach can be reopened just for that day. More to come on that! The area behind the beach will be being worked on for about 15 months. That part of the project will include some new parking spaces, real bathrooms, better ADA access, an accessible beach overlook, a seasonal wetland (where the parking lot tends to flood after it rains), expanded sand dunes, and connecting the Bay Trail between Gilman and Buchanan. ALDOG TAKES 8,000+ LBS OF TRASH OFF BEACH OVER FIVE YEARS: ALDOG became a California Coastal Commission adopter of Albany Beach in 2013. For the past five years, we have organized three beach cleanups a year and participated in more. To date, more than 900 volunteers at our events have removed more than 8,000 pounds of microplastics, plastics, and other trash from the beach. Thank you, everyone! You have made a difference. And thank you East Bay Regional Park District for your support and Golden Gate Fields for letting our volunteers park in your lot behind the beach. We couldn’t have done it without all of you. 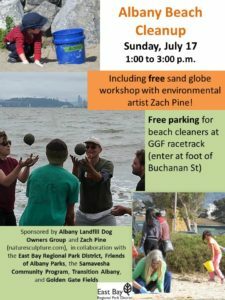 LAST BIG BEACH CLEANUP & SAND GLOBE WORKSHOP ON JULY 22: On S unday, July 22, from 1 to 3 p.m., we’ll hold our last big Albany Beach cleanup and free sand globe workshop with environmental artist Zach Pine. Come join us to thank the beach and celebrate the community! Parking will be free, courtesy of Golden Gate Fields, in the lot at the bottom of Buchanan Street (near the herons sculpture roundabout). Phases 2 and 3 will add permanent bathrooms, some parking, ADA access to the beach, better water access for kayaks and kiteboarders, bigger sand dunes, and seasonal wetlands (where the parking lot tends to flood after a heavy rain), and will connect the Bay Trail from Gilman Street to Buchanan Street by running it behind the beach. This is a big project and the beach may be fenced off for months. The schedule isn’t available yet, but we do know there will be an Earth Day cleanup on April 21 and ALDOG was told we shouldn’t expect to do our usual July beach cleanup. So that’s the window. If the entire project moves along without delays, apparently it might all be done by…May 2019? We don’t know whether dogs will be allowed on the beach when it opens again. Sierra Club and SPRAWLDEF (an organization led by Sierra Club leader Norman La Force) have already sued the park district twice to prevent that. They have said that many people are afraid of dogs, and that people who bring dogs to the beach disenfranchise other park users. WE believe that the beach is an important recreation option for park users with dogs. Families, seniors, people with mobility issues, all kinds of people along this busy urban shoreline get huge benefits out of being able to visit the beach with their canine family members. And the park district has half a dozen swimming beaches just for people, two swim lagoons, and two swimming pools — but just this one place where people can play with their dogs at the water’s edge. 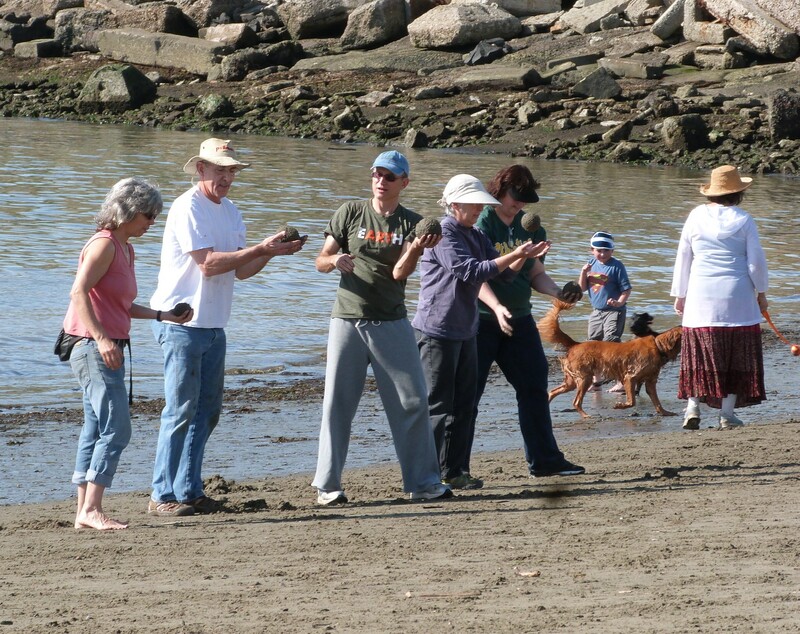 Plus, let’s get real…the beach has been shared successfully for years by dogwalkers, kiteboarders, kayakers, families with small children, seniors with and without dogs, picnickers, artists, and more. We may all need to speak up at some point for recreational dogwalking on Albany Beach. Once the fences go up, though — our community will be scattered to the winds. So: For the next several weeks ALDOG will have volunteers down on the beach letting people know what’s up. We’re urging people to sign up for email updates and alerts on this website or by emailing albanycadogs@gmail.com. Please spread the word. EBRPD DOG POLICIES UPDATE: EBRPD’s volunteer Park Advisory Committee has been reviewing and revising the park district’s dog policies and recently sent a draft document to the district’s Executive Committtee for consideration. The collaborative, year-long process engaged dog advocacy groups throughout the East Bay (ALDOG, Point Isabel Dog Owners, Oakland Dog Owners Group, Lamorinda Dogs, professional dogwalking firms, and more), the environmental community, cattle ranchers, and park district staff. The fairly balanced document includes recommendations that could be rolled out over the next few years but is not a radical departure from existing dog rules. The Executive Committe could suggest changes or forward the document to the full Board for approval soon. 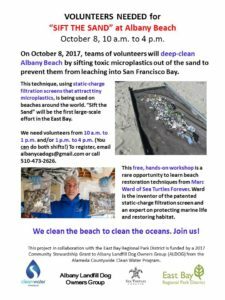 ALDOG COORDINATES FIRST BIG MICROPLASTICS CLEANUP IN EAST BAY: On October 8, 2017, ALDOG brought together 115 volunteers who removed 2,440 pounds of plastics and plastics-contaminated debris from Albany Beach. (Click here for the complete write-up on the Alameda Countywide Clean Water Program website.) Our “Sift the Sand” event was made possible by a grant to ALDOG from Alameda Countywide Clean Water Program and the support of East Bay Regional Park District. Sea Turtles Forever, which invented the microplastics screening technique, supervised the event. Albany Community Foundation fed our volunteers, Trader Joe’s — El Cerrito provided snacks, The Watershed Project helped us with equipment and onsite support, and St. Mary’s College High School rounded up a couple of dozen kids who helped make the day a big success. Below are before and after shots…the beach on October 7 and then at the end of the day on October 8. FIRST BEACH CLEANUP OF 2018 IS FEBRUARY 11, 1 TO 3 P.M.: Please join us to remove whatever the winter storms washed in. We’ll have several static-charge filtration screens for volunteers to learn to sift microplastics out of the sand, too. Parking is free in the lot nearest the beach, courtesy of Golden Gate Fields. 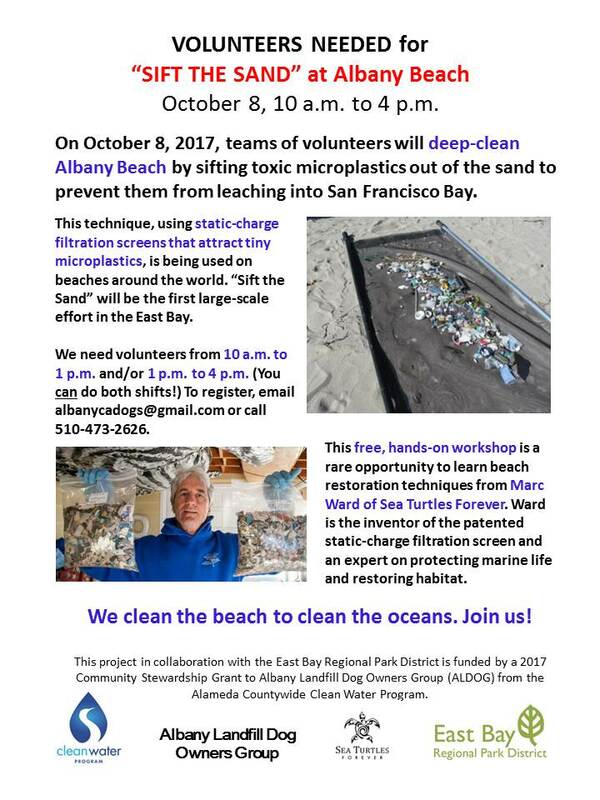 FIRST BIG MICROPLASTICS REMOVAL EVENT IN EAST BAY A HUGE SUCCESS: On October 8, 2017, ALDOG’s big microplastics removal event sifted more 2,440 pounds of plastics and plastics-contaminated debris from the sands of Albany Beach. Read more about it at the Alameda County Clean Water Program’s page. Thank you to the 115 volunteers who removed 2,440 pounds of debris in just six hours. 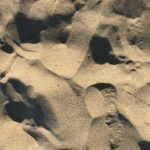 ALDOG AWARDED ALAMEDA COUNTYWIDE CLEAN WATER PROGRAM (ACCWP) GRANT TO REMOVE MICROPLASTICS FROM ALBANY BEACH: ALDOG has been awarded an ACCWP 2017 Community Stewardship Grant to help it remove tox ic microplastics from the sands of Albany Beach. The grant will enable ALDOG to buy static-charge filtration screens and other equipment, and bring Marc Ward onsite to supervise the cleanup and teach volunteers how to restore beaches to near-pristine condition. Ward is the inventor of the patented screens we’ll be using, founder of Sea Turtles Forever, and an expert on restoring beaches to near-pristine condition. This event doubles as a rare, free, hands-on workshop with Ward, who has restored beaches from Costa Rica to Alaska. We’ll be running two shifts: 10 a.m. to 1 p.m. and 1:00 p.m. to 4:00 p.m. Some people are signing up for both — which is great, because we need dozens of volunteers. Email albanycadogs@gmail.com or call 510-473-2626 to sign up. Let us know which shift works for you, how many other people you’re bringing, and your email address and voice contact information. This project is in collaboration with the East Bay Regional Park District. Parking is free in the lot nearest the beach, courtesy of Golden Gate Fields. BEACH CLEANUP & SAND GLOBE WORKSHOP ON SUNDAY, JULY 16, FROM 1 TO 3 P.M.: Our second big beach cleanup of the year is Sunday, March 5, 1 to 3 p.m. 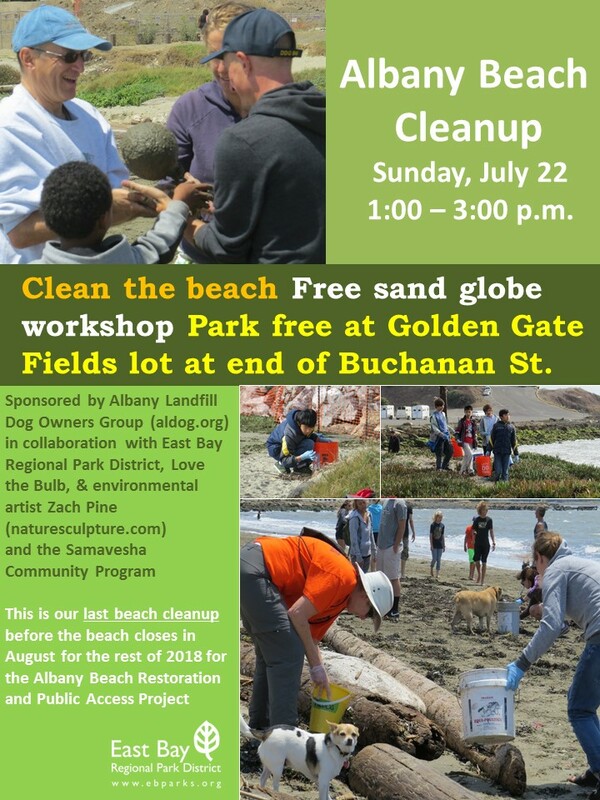 Please join us, Friends of Albany Parks, the Samavesha Community Program, and the East Bay Regional Park District to take plastics and other trash off Albany Beach. Free and super-fun sand globe workshop with environmental artist Zach Pine, free parking in the lot nearest the beach courtesy of Golden Gate Fields racetrack. Bring your own buckets, sieves, and gloves or use ours. See you there! 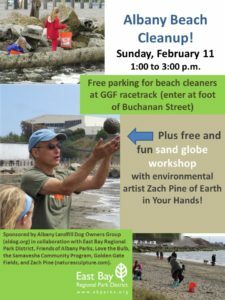 BEACH CLEANUP & SAND GLOBE WORKSHOP ON SUNDAY, MARCH 5, FROM 1 TO 3 P.M.: Our first big beach cleanup of the year is Sunday, March 5, 1 to 3 p.m. 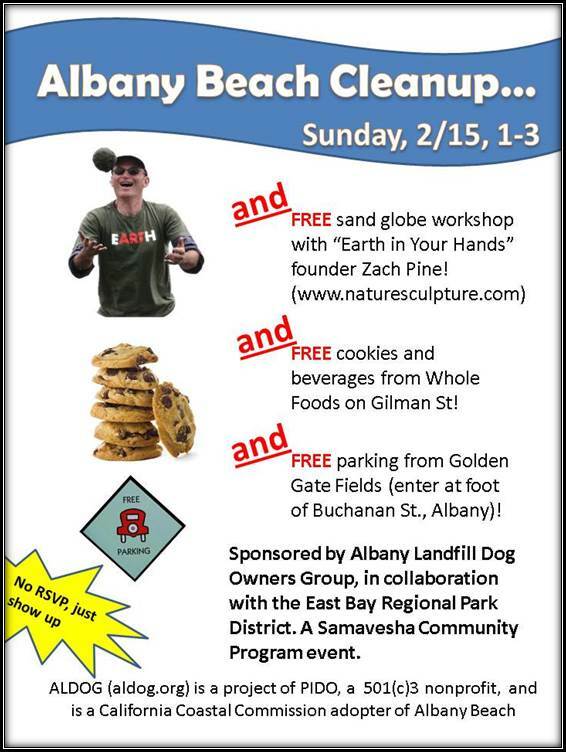 Please join us, Friends of Albany Parks, the Samavesha Community Program, and the East Bay Regional Park District to take plastics and other trash off Albany Beach and the surrounding rocks. 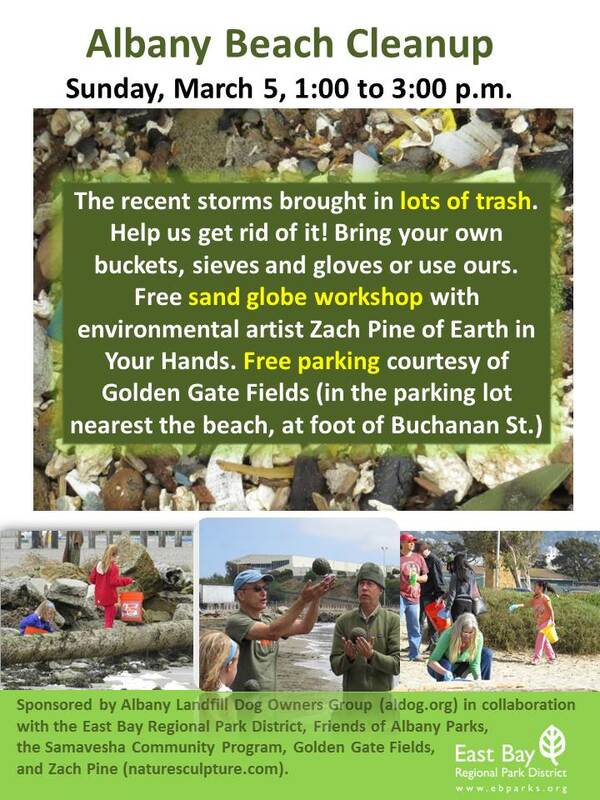 Free and super-fun sand globe workshop with environmental artist Zach Pine, free parking in the lot nearest the beach courtesy of Golden Gate Fields racetrack. Bring your own buckets, sieves, and gloves or use ours. See you there! 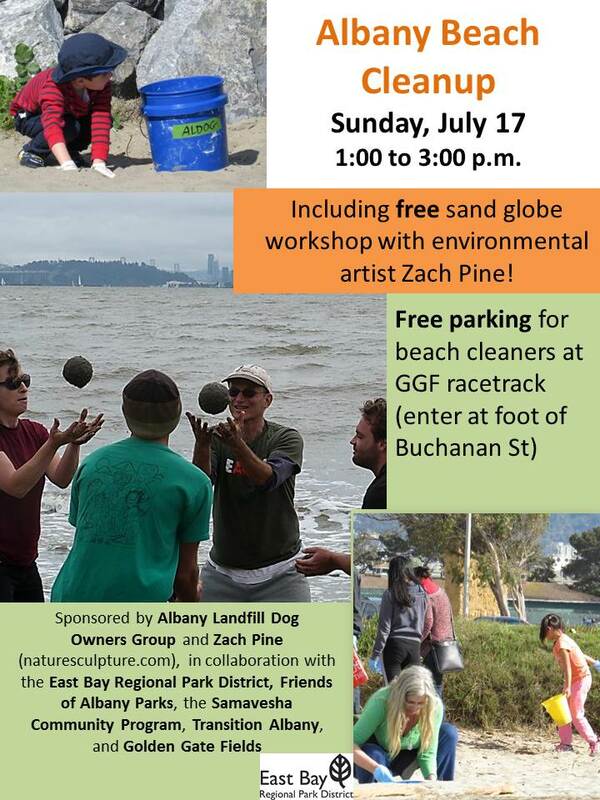 BEACH CLEANUP & SAND GLOBE WORKSHOP ON SUNDAY, JULY 17, FROM 1 TO 3 P.M.: Join ALDOG, environmental artist Zach Pine, the East Bay Regional Park District, Friends of Albany Parks, the Samavesha Community Program, and Transition Albany for our next big beach cleanup and sand globe workshop! 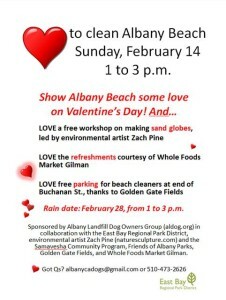 Parking is free for beach cleaners, courtesy of Golden Gate Fields, in the lot at the foot of Buchanan Street. JOIN ALDOG AT “HANDS ACROSS THE SAND” ON MAY 21, 11 A.M. – 1 P.M. On Saturday, May 21, join Zach Pine Nature Sculpture’s “Hands Across the Sand” event on Albany Beach in partnership with Albany Landfill Dog Owners Group, Berkeley Climate Action Coalition Water Committee, Citizens for East Shore Parks, The Watershed Project, and Transition Albany. We’ll clean the beach, make a community statement about clean air, earth, and water, and celebrate with a sand globe workshop. ALDOG will demo our specialized electrostatic screen for sifting microplastics out of the sand. Thank you, Golden Gate Fields, for free parking for event participants! MIGHTY MUTT MARCH BRINGS DOG GROUPS FROM AROUND BAY AREA: On Saturday, April 23, from 11:00 a.m. to 1:00 p.m., dog-owner groups from all over the Bay Area will march and rally at Crissy Field to protest planned restrictions on on-leash and off-leash recreational dogwalking in the Golden Gate National Recreation Area. After the rally we’ll do an Earth Day cleanup at East Beach. Please join us for the Mighty Mutt March! East Bay dog groups are turning out in force. The proposed restrictions are opposed by many local officials and thousands of Bay Area residents, but the National Park Service has turned a deaf ear. For more information about the issue, please visit Save Our Recreation. For maps that make clear what’s at stake, check out this document: Quick overview of GGNRA proposed rules for recreational dogwalking. PARKING INFORMATION: There is parking on Old Mason Street near Stillwell Hall (650 Old Mason Street), at the end of the street at the West Beach parking lot (march starting point); at East Beach (march ending point); and at the Presidio Main Post (free shuttle to Crissy Field). ALDOG’S VALENTINE’S 2016 BEACH CLEANUP A HEARTWARMING SUCCESS: By the numbers: 48 volunteers (including lots of kids! ), 300 pounds of plastics and trash sifted, gathered, and hauled away, and about 80 pounds of recyclables… bringing our total take to 3,600 pounds of garbage removed from the beach and the environment since 2013. Thank you, awesome volunteers! And thank you, East Bay Regional Park District, Golden Gate Fields, Friends of Albany Parks, Whole Foods Market Gilman, and Zach Pine Nature Sculpture and the Samavesha Community Program. 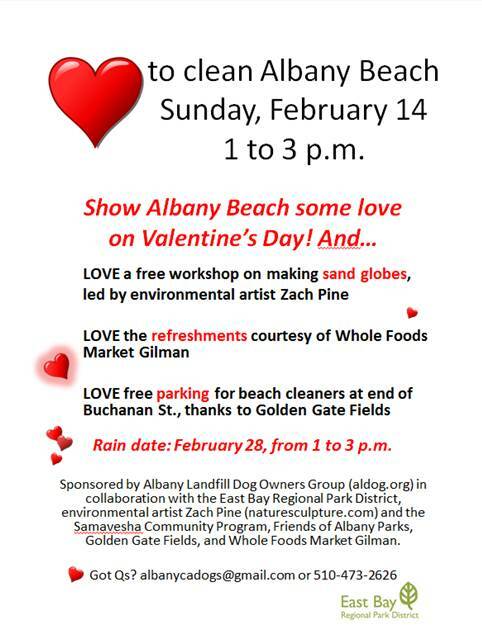 ALDOG’S NEXT BEACH CLEANUP IS THIS VALENTINE’S DAY FROM 1 TO 3 P.M. Please join us! Bring your own buckets, gloves, and sieves or use ours. 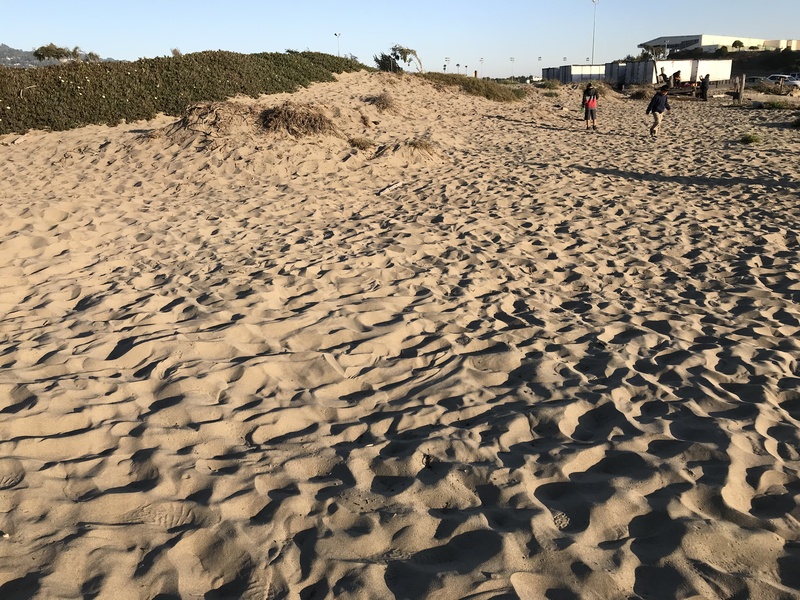 ALDOG’S COMMENTS AND EBRPD’S RESPONSES: The EBRPD has published its responses to the public comments on its recent Supplemental Environmental Impact Report (SEIR) for the upcoming Albany Beach Restoration and Public Access Project. (After being sued by SPRAWLDEF, the District had to do an SEIR focused solely on the potential impact of dogs on Albany Beach.) ALDOG’s comments were inadvertently left out of the Final SEIR and issued later as a supplement (see link below). STUDIES ABOUT THE IMPACT OF PEOPLE AND DOGS ON WILDLIFE: Several studies suggest that people with dogs don’t have much impact on wildlife in urban parks. In more remote places, it’s becoming clear that people — even birdwatchers — have an effect on wildlife, but that people with dogs aren’t any worse than people themselves. 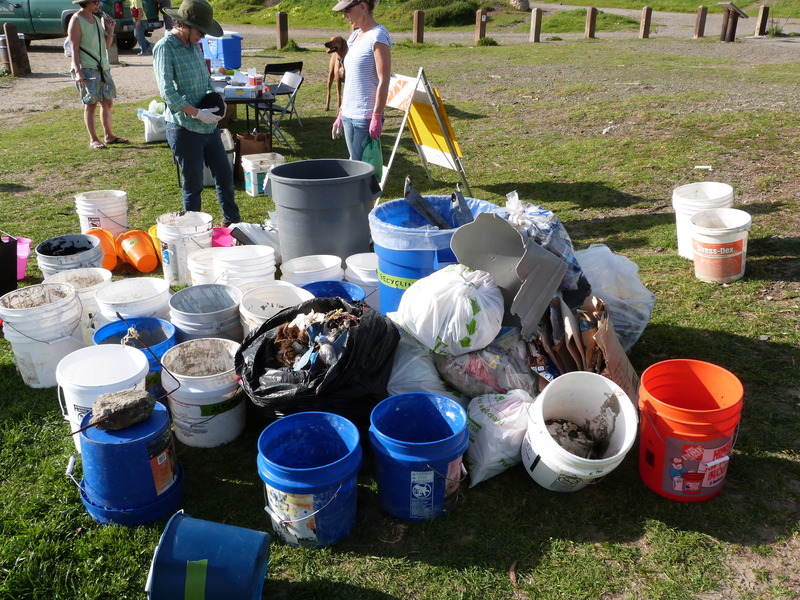 ALDOG’S FEB 2015 BEACH CLEANUP COLLECTS 450 LBS OF TRASH: On February 15, 2015, some 80 volunteers (including 14 kids) removed 450 pounds of trash from Albany Beach and the shoreline road. That included about 40 pounds of recyclables which we took to the recycling center. (And brings our total to-date to 2,800 pounds since we started formal cleanups under the California Coastal Commission Adopt-a-Beach program in 2013.) Thank you Cub Scouts, Albany High students, and Delta Sigma Pi at CSU East Bay, and thank you Zach Pine for your wonderful sand globe workshop. And thank you to our mascot seal, who hung out for at least an hour watching everyone work. Thank you to Whole Foods Market, Gilman Street, for providing cookies, drinks, and hand wipes… to Golden Gate Fields for giving beach cleaners free parking… and to the East Bay Regional Park District for collaborating with us on the cleanup. Thank you to the City of Albany for letting us use your Big Belly compactors on Solano Avenue for our beach cleanup flyers. 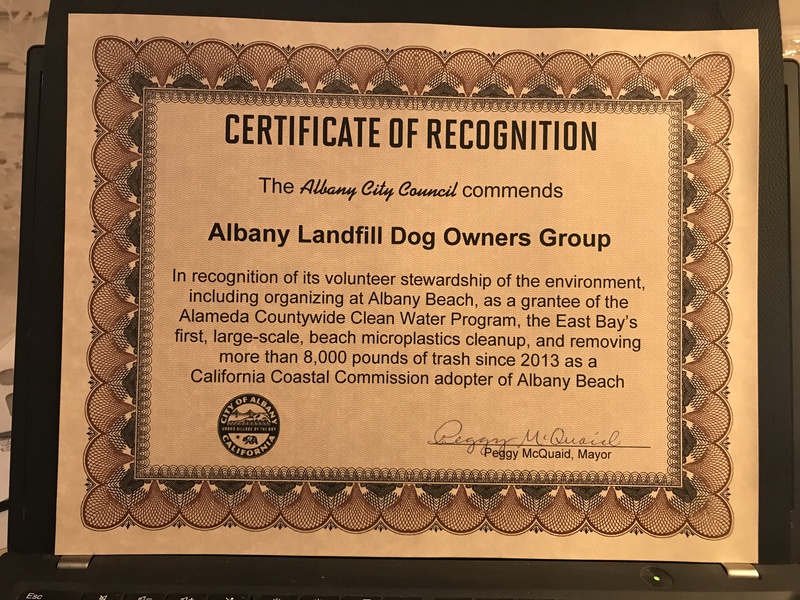 ALDOG’S RESPONSE TO THE SUPPLEMENTAL EIR RE: ALBANY BEACH: The East Bay Regional Park District recently produced a Supplemental Environmental Impact Report (SEIR) focused on the impact of dogs on Albany Beach. This was the result of a lawsuit (SPRAWLDEF vs. EBRPD) over the park district’s EIR for its upcoming Albany Beach Restoration and Public Access Project. The lawsuit claimed the EIR was inadequate, the district went back to gather more data, and then the public was invited to comment on the Supp EIR. The peculiar complaints of SPRAWLDEF and Sierra Club have focused almost exclusively on the fear of dogs. They submitted comments on the original EIR that included 18 references to articles about the fear of dogs, said that fear of dogs is a disability, and that the park district has an obligation under the Americans with Disabilities Act to accommodate people who can’t come to Albany Beach because there are dogs there. We kid you not. We couldn’t make this stuff up. When did Sierra Club become the mouthpiece for fear of dogs, we wonder? Was it because their other arguments were just so thin? 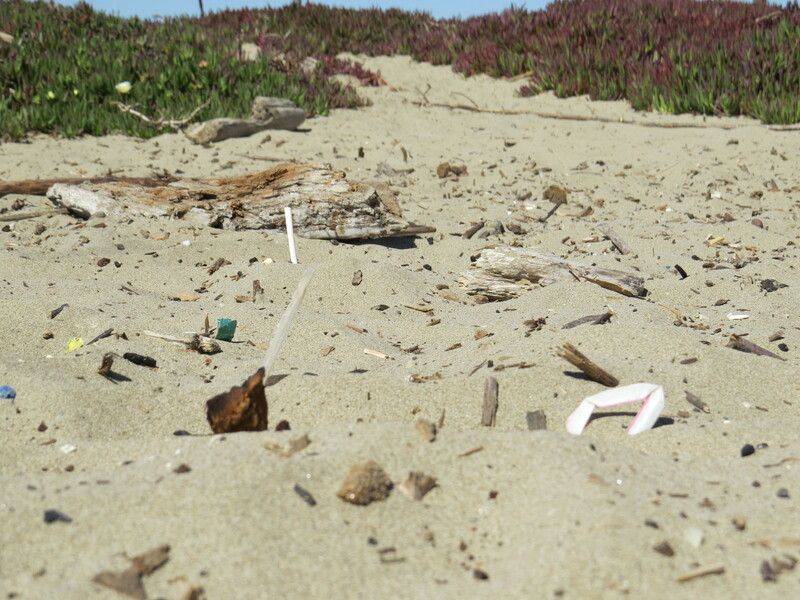 Meanwhile, Albany Beach is awash in toxic plastics, microplastics, sharps, and more. But I suppose the groups above are doing enough for the beach just by targeting people with dogs. Let’s get real: There is just is no environmental rationale for kicking people with dogs off Albany Beach. If anything, that would be a policy issue… should people with dogs be allowed to continue to share the beach with other users, as they have for the past 50 years? Or should several special interest groups — SPRAWLDEF, Sierra Club, Citizens for East Shore Parks, and Audubon Society — get to handpick the groups they think deserve to enjoy the beach? 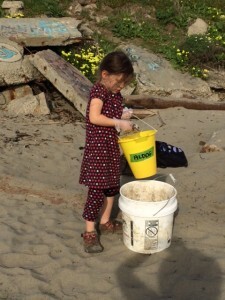 ALDOG’S NOV 16 BEACH CLEANUP TOOK 350 LBS OF TRASH OFF THE BEACH! Thanks to more than 60 great volunteers, we took 350 pounds of trash off Albany Beach on November 16, bringing the year’s total to 1,350 pounds. Thank you especially to Zach Pine and his sand art workshop, Albany Middle School, Albany High School, and Cal State East Bay for all the TLC for the beach. Thank you East Bay Regional Park District for your wonderful partnership and thank you Golden Gate Fields for free parking for our beach volunteers! NOV 16 BEACH CLEANUP AND FREE SAND GLOBE WORKSHOP: Please join our last beach cleanup of the year this Sunday from 1 to 3 p.m.! 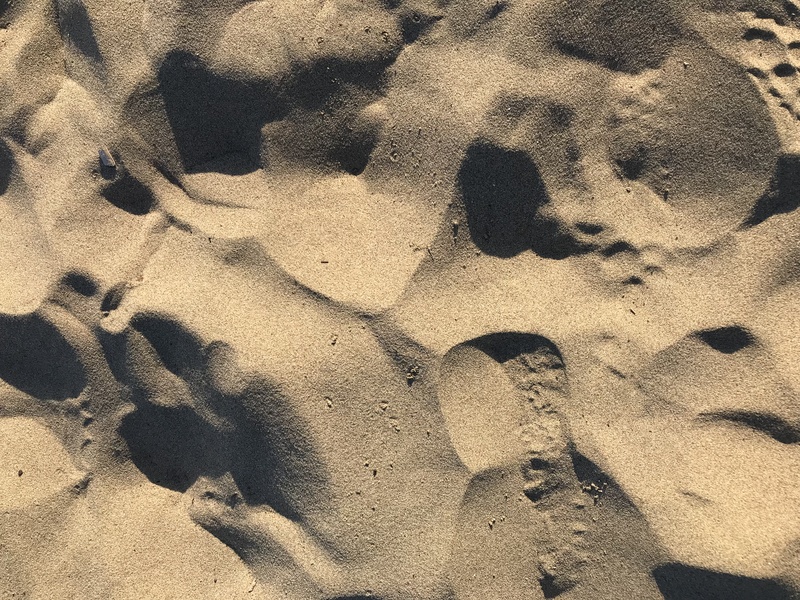 Clean the sand and then get creative making big, amazing sand globes with artist Zach Pine. Parking is free courtesy of Golden Gate Fields. (Drive to the foot of Buchanan and turn left into the lot. Walk through the eucalyptus grove to our sign-in table. Bring your own gloves and buckets or use ours. This cleanup is in collaboration with the East Bay Regional Park District (EBRPD). Note: Cleanup is rain or shine. 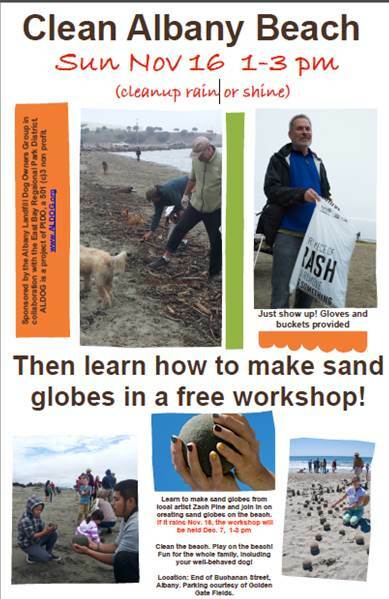 Rain date for sand globe workshop is Sunday, December 7 (same time, same place, street parking only). 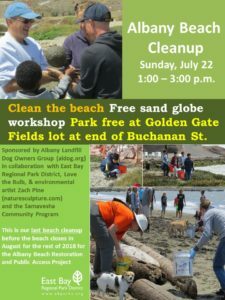 Albany Beach cleanup, Sunday July 20, 1 to 3 p.m.: Please join us for our second big cleanup of the year, held in collaboration with the East Bay Regional Park District. Parking is free, courtesy of Golden Gate Fields. (Drive to the foot of Buchanan Street, by the roundabout and the heron sculpture, and turn left into the parking lot. Park, walk through the eucalyptus grove, and head to our sign-in table.) Bring your own gloves and buckets or use ours. 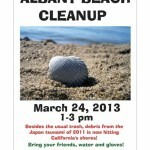 Help us keep Albany Beach clean and beautiful! For more info, contact us at albanycadogs@gmail.com or call (510) 473-2626. Artist Zach Pine is also conducting a sand art workshop at Albany Beach from 2 to 5 p.m.! Come for the cleanup and stay on for a very cool workshop on making globes of sand as part of a spontaneous, community art installation. 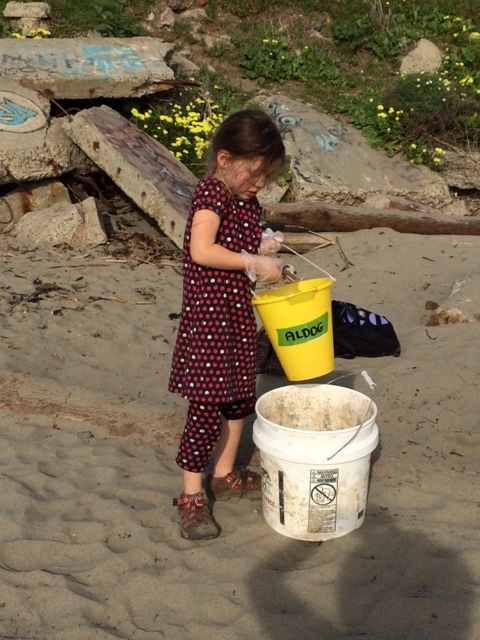 Our February 23, 2014 cleanup took about 350 pounds of trash and recyclables off Albany Beach and surrounding areas. We also screened microplastics and debris from a small area of the beach using our new screen from Sea Turtles Forever (STF). Thanks to our volunteers, STF, the East Bay Regional Park District, and Golden Gate Fields (which let beach cleaners park in their lot for free)! 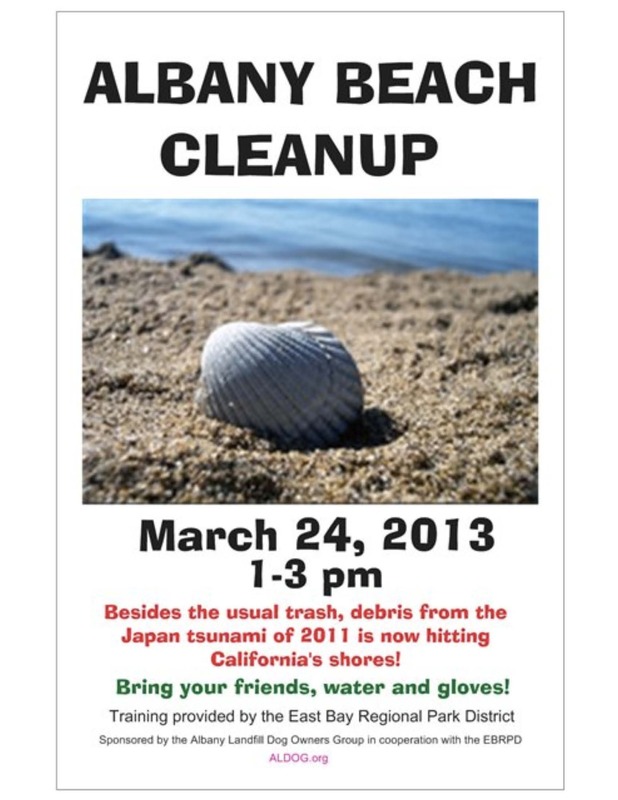 ALDOG’s 2014 Albany Beach Cleanups are Feb 23, July 20, and Nov 16 (all Sundays, all from 1 to 3 p.m.). Park free courtesy of Golden Gate Fields… tell the parking attendant you’re with the cleanup. Park near the dunes and come sign in at our table overlooking the beach (near the beginning of the shoreline trail). Bring your buckets and gloves or use ours. See you there! ALDOG is an official California Coastal Commission adopter of Albany Beach. In 2013 we removed 1,000 pounds of debris from the beach. Our beach cleanups are in collaboration with the East Bay Regional Park District. Thank you, EBRPD! JUNE 2013 CLEANUP NETS 350 POUNDS OF DEBRIS: Forty-five volunteers braved cool weather to comb Albany Beach and bring in 350 pounds of debris on Sunday, June 23. Thank you! And thank you, East Bay Regional Park District, for collaborating with us to coordinate this cleanup. 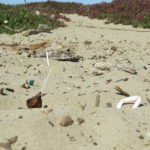 This is the second of three cleanups ALDOG has committed to as an official participant in the California Coastal Commission’s Adopt-a-Beach program. ALDOG’s goal is to to remove 1,000 pounds of trash from the beach this year. Please join our December cleanup — tentatively scheduled for December 8 — to help us meet our goal! BEACH CLEANUP BRINGS IN 250-300 LBS. OF TRASH: The ALDOG-sponsored beach cleanup on March 24, in collaboration with East Bay Regional Park District, brought in 250-300 pounds of mostly microplastics, Styrofoam, and cigarette butts (along with fishing line, construction debris, rotten fabrics, rope, etc.) For the complete story see the Albany Patch article here. 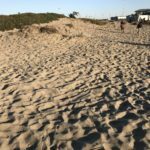 SPRAWLDEF SUES EBRPD TO FORCE RESTRICTIONS ON DOGS AND WINDSURFERS:iN Four people who call themselves SPRAWLDEF have filed suit against East Bay Regional Park District to force it to restrict or perhaps ban off-leash dogs and windsurfers on Albany Beach. This small litigation unit is apparently attempting to derail the long public process by which the Albany Beach Restoration Project Environmental Impact Report was developed and approved (including public hearings, testimony, and considerable expenditure of East Bay tax dollars). SPRAWLDEF was founded by the Sierra Club’s Norman LaForce and three others. LaForce and Jeff Inglis are also members of the Board of Directors of Citizens for East Shore Parks, the nonprofit that helped create McLaughlin East Shore State Park in 2002 and has worked to restrict dogs in the park ever since. Please join our mailing list to get updates on this situation as it unfolds. PLEASE PICK UP AN EXTRA POOP: Make the park cleaner by doing a two-fer every time you walk your dogs. Email albanycadogs@gmail.com if you can coordinate monthly cleanups of the Plateau! NEW LEASH LAWS TOOK EFFECT MAY 17, 2o12: In April 2012 the East Bay Regional Park District Board of Directors approved several changes to the ordinance that includes rules about dogs in the parks. The broadest change is the “200 foot rule.” As first proposed, this would have required dogs to be on-leash in parking lots, at staging areas, and for the first 200 feet of every trail throughout the 110,000-acre park district. Off-leash advocates persuaded the Board and staff to add “as posted” to the proposed language. This big win means that the 200 foot requirement will apply selectively at posted trails rather than automatically on all trails. The other big change is that dogs must now be on-leash on the Dunn and Serpentine trails in Redwood Regional Park at the request of equestrians from the nearby stables. The only change at Point Isabel is that dogs and other animals must be on-leash in the parking lots. Please contact ALDOG at albanycadogs@gmail.com. SIGN UP FOR FOR SHORT, INFREQUENT EMAIL UPDATES FROM ALDOG. If you don't get a confirmation email right away, please check your junk mail folder and mark ALDOG "not junk mail/spam"!